In Lead the Meerkats you are a young meerkat and you have a lot to accomplish. You have been separated from your pack and the time has come for you to form your own meerkat pack. Are you ready for the challenge? Name your pack and its meerkats. Dig burrow networks and enlarge your territory. Forage for food and grow your pack size. Stay on guard and be ready to make quick decisions. Run to the safety of the burrows or fight your enemies. Go head to head with a rival meerkat pack. Lead your pack to victory and rule the savanna. Lead the Meerkat is the first game to simulate the exciting life of meerkats. Lead your pack and enjoy the company of these lively and endearing animals. 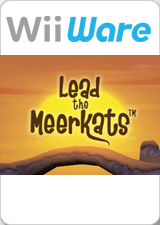 Lead the Meerkats offers a fun gameplay experience for animal lovers of all ages. The graph below charts the compatibility with Lead the Meerkats since Dolphin's 2.0 release, listing revisions only where a compatibility change occurred. This page was last edited on 19 January 2018, at 00:53.